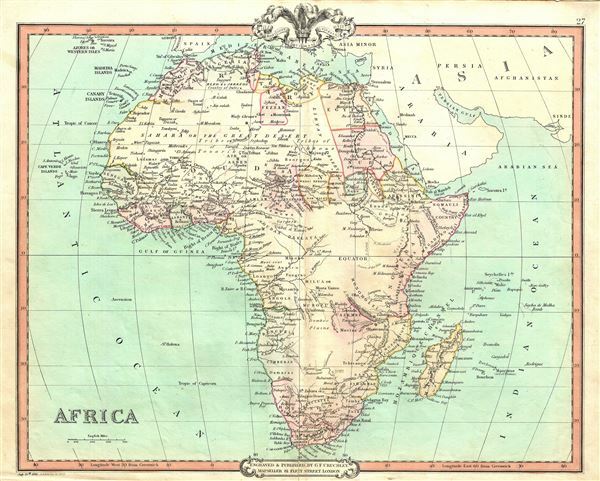 This is a beautiful 1852 map of Africa issued by George Frederick Cruchley. It details the continent of Africa, including Madagascar, on the cusp of the great exploratory expeditions of the mid-19th century undertaken by Speke, Livingstone, and Stanley. Though European colonies and outposts dot the coastlines, much of the interior remains unknown, even speculative. The speculative source of the Nile is shown to be somewhere south of the equator. Mt. Kilimanjaro and Mt. Kenya, first sighted by western explorers 1848 and 1849, are identified. Lake Malawi, near Mozambique, appears in embryonic form, no doubt drawn from indigenous and missionary reports, but gives some hint of the Great Rift Valley lakes soon to be discovered. At the time this map was made, the slave trade, thriving since the 5th century was rapidly diminishing due to decreased demand for slaves in the New World, the British outlawing of slavery in 1808, and subsequent diplomatic efforts including treaties with over 50 African rulers outlawing the practice. Many African economies adapted by shifting to the export of mineral and agricultural resources, which led to the European scramble for territory, occupying most of the continent by the end of the 19th century. Europe's colonial interests in Africa haphazardly carved up the continent into unnatural territories, often forcing historic enemies into close proximity and leading to social problems that remain to this day. Very good. Minor wear and verso repair along original centerfold. Blank on verso.